FREE tours begin every half hour between 1:00 & 4:00 p.m.
Tony talks about conservation and renewable energy at Open House 2013. Photo by Angela Neese. Dancing Rabbit was founded in 1997 to find out how people can live rich, vibrant lives while leaving an ecological footprint that our planet can sustain. 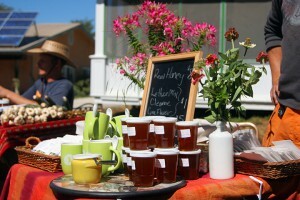 Come learn about sustainable living and see all that we have created! There will be loads of friendly Dancing Rabbit members to answer your questions, a Village Fair selling unique crafts and goods and some complimentary refreshments. What’s not to like? See alternative building methods such as straw bale and cob up close and personal! Ask questions of the builders themselves – we love to talk about our buildings. Tour an organic garden and chat with some of our gardeners. Learn about renewable energy and how we power our village with the sun and the wind. Be amazed that 70 people can share 3 cars, a truck, and a tractor and feel good about it! 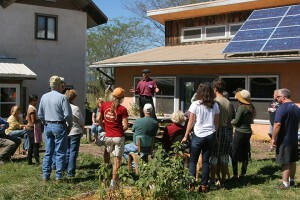 Understand more about sustainable and cooperative living. Drink (filtered) rainwater, and learn about our water catchment systems. Discover more about how we are making the world more sustainable. Find out the top ten most misunderstood things about Dancing Rabbit! We’ll also have a Village Fair with unique crafts and goods from our ecovillage members and neighbors, plus complimentary refreshments. Comfortable walking shoes are highly recommended. It’s probably no surprise that carpools are encouraged. Here are biking or driving directions. It may not be quite as good as attending in person, but for a fun virtual experience of attending the 2013 Dancing Rabbit Ecovillage Open House and Village Fair, here’s the full-length version of the video— enjoy! In case you missed it, here’s the condensed version of the video. Thanks for watching, and please share with interested folks!